I’d like to share something very special with you. A few months before her (unexpected) death, I had the great honor and privilege of interviewing Deborah Taj Anapol (1951-2015). This beloved teacher, known to many as the mother of the polyamory movement, was a clinical psychologist, author, and radical teacher. Co-founder of the Loving More magazine, Anapol birthed such keystone books as Polyamory: The New Love Without Limits, The Seven Natural Laws of Love, and Polyamory in the 21st Century. It’s been three years since the interview. In my life lately, I’ve been diving even more deeply into profound questions about sexuality, intimacy, consciousness, and human connection. More and more friends are seeking me out, asking whether polyamory and open relationships have a place in their spiritual journey. Anapol’s work seems ever-relevant, ever-poignant. Her teachings are simple. If we open our hearts, we lead a more joyful life. If we move past fear and jealousy, we feel more connected to Source. If we can look within, what we see on the outside—in our relationships—will be rich, fulfilling, and abundant. Anapol reminds us that sexuality is a mirror for how we perceive ourselves. If we view sexuality (ourselves) as sinful or wrong, then that is exactly what it will be for us. If, on the other hand, we view it (ourselves) as sacred, as a beautiful gift, then that is exactly what it will be. Here is the interview. (It was originally published on my previous blog.) I hope you find it every bit as relevant and awe-inspiring as I continue to do. Anya: What is love, and how do we recognize it? Deborah: Love is a vibration, a state of consciousness, an unconditional acceptance of what is along with the awareness that All is One. Love may or may not speak out or take action in response to injustice, but love does not take a position. It’s beyond duality. We can recognize love by its energetic signature, by how we feel in the presence of love. 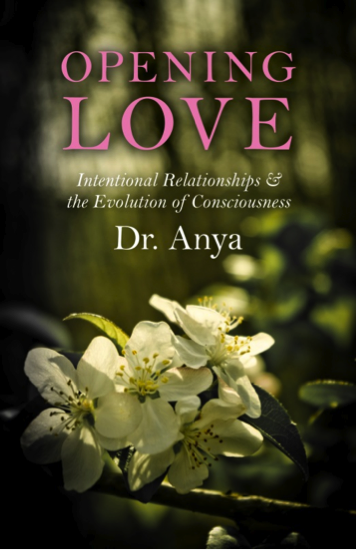 Anya: Once we recognize love and feel its presence, how can we get out of love’s way and allow it to lead? Any practical strategies? Deborah: Essentially, allowing love to lead means that the Ego or Personality stops trying to control and manipulate according to its mission to save us from perceived danger. Instead, we learn to listen, to be receptive and move along the path illuminated by love. We take actions that expand love or increase the vibration of love. We surrender to love’s guidance and stop listening to the voices that lead to fear and contraction and judgment. The mind can be tricky and masquerade as the voice of love telling us what we “should” do and making us wrong for asserting ourselves. So the first step, practically, is self-observation. Noticing what you are thinking and feeling and doing and why and what the results are. Many people will need some guidance in learning how to do this and the reflections of others who are more self-aware to point out when you’ve gotten off track. Anya: Let’s talk about self-reflection. I am endlessly fascinated by observing how I change over time, by looking back at various projects over the years, and comparing my philosophies then to my philosophies now. How have your views on polyamory changed since you published your first book on polyamory in 1992? Deborah: My views on polyamory itself really have not changed much at all in that time. What has changed is that I no longer see polyamory as a way to radically change the culture or as a radical solution to the many problems of modern life. Instead it seems that what’s happening is that polyamory is being used to prop up the status quo. Anya: In what ways do you see poly being used to prop up the status quo? Deborah: Atlantic Magazine has joined the ranks of mainstream publications running favorable articles about polyamory. Recently, the emphasis seems to be on how jealousy is manageable, or even non-existent. This makes total sense if you are trying to promote polyamory because once people get over their moral/religious objections, one of the main stumbling blocks is jealousy. The other main stumbling block is time and the cure for that is to work less, but no one seems to be mentioning that yet. If we ever decide that the 40 hour (or for many the 80 hour) work week needs to be cut in half (while increasing income for low and middle income people) and people can be enticed to work less if they can have more intimacy in their lives, then we’ll be getting somewhere. Over the last 30 years I’ve witnessed a huge change in how the print media relate to polyamory. It’s gone from an unofficial black out to advocacy. I’d like to think that it’s just that the mainstream has seen the light and is getting more tolerant of diversity, but I don’t see similar articles about how fabulous it is to be gay, for example. Judging by the kinds of questions coming from journalists who’ve interviewed me, social policy experts have realized that the nuclear family is an endangered species, just as I predicted in the 80’s. So the question becomes, how can we keep couples together so that we don’t have to shift our whole concept of relationship? How can we lower the divorce rate? Without families, there is a greater burden on government funded social services. Since we prefer to spend our tax dollars on the military and bailing out financial institutions, something needs to be done to save the family and preserve the kind of thinking and behavior that says, “these people are my family and I will share my resources with them and take care of them.” That’s all well and good but I’d like to see this attitude extending to all life—all people, animals, plants, oceans—our whole global social and environmental ecological web. Dr. Anapol, if you had not become poly, how do you think you would be different person today, on a spiritual level? Deborah: First of all, I did not “become poly” so much as notice that I was not monogamous and never had been. Once I let go of the identity of monogamy, I attracted a series of lovers who reflected different parts of myself. This allowed me to experience and integrate all of me for the first time. If there had been one person who could be my perfect mirror, I don’t think this would have been necessary, but that’s not what life brought me. And I don’t think it’s what life brings most people, honestly. There is truth in the old saying, “All roads lead to Rome.” I think the journey would ultimately lead to the same place, but it would take longer to get there. Polyamory accelerated my process and that wasn’t always pleasant. Without polyamory I might still believe that my happiness was dependent on another person, and I might still think that if only I could find the perfect partner I would be happy. I would have missed the sense of freedom that came when I realized at 23 that jealousy was a choice that I didn’t have to make. Anya: Who have been your most important relationship teachers? Deborah: Without a doubt my lovers and partners have taught me more than anyone, and especially the ones who were leading edge innovators and teachers in this area. Dane Rudyar, in his wonderful little book, Directives for New Life, says that without a high level of intimacy and interpenetration, nothing much happens in the way of transformation. Anya: What do you believe is the biggest impediment to transformation on a global level? What is humanity’s greatest resource for conscious relating? Deborah: This may sound silly, but it’s true. The biggest obstacle to conscious relating is lack of consciousness. People like to talk about conscious relating and feel superior about thinking they are doing it, but when you get down to it, you have to do the personal work of evolving your consciousness. No one can do it for you. This evolution is going to look a bit different in different environments, but it’s all evolution wherever you are starting from. In some places, the environment, the culture, is more supportive of change, in some places less, but I think the inner work is more significant and is truly our greatest resource. Having good role models helps of course, but if you haven’t got the awareness to recognize them, what good are they? Anya: What else would you like to share? Deborah: It was important for me at a certain point to let go of the monogamous identity and it seemed useful at the time to replace that with a “polyamorous” identity so that I could see what I was up to. It sounds strange, but I hadn’t really noticed that I was involved in multiple relationships and loved more than one person until I expanded my map of what relationships were possible. But after a while, the polyamorous identity can become just another limiting belief, another imaginary category to be mistaken for “who I really am.” Many people, including myself, who’ve been on this journey for a while, don’t want to empower a label to define them. Labels can facilitate communication with other people, at least if the label means the same thing to them that it does to you. Ultimately though, labels become a distraction from realizing that we are much more than any concept can encompass.